Olympus has announced its $399.99 SH-1 compact with a 24x zoom that enjoys the Olympus OM-D E-M5's mechanical image stabilization in addition to 1080 60p HD video and built-in WiFi. The SH-1 will be available in May in black, white or silver and can be preordered now from B&H. With a body design inherited from the company's PEN cameras, the SH-1's in-body 5-axis sensor-shift image stabilization has been enhanced to support still images and correct for different kinds of camera shake. It also incorporates a new hybrid image stabilization to electronically stabilize movie shooting. Like the TG-3 has announced, the SH-1's WiFi can be setup by reading a QR code on its LCD with a smart device that can then control the camera and transmit images to the Web. Through the free iOS or Android Image Share app, Live View can display the camera image on the smart device screen. Interval Shooting captures up to 99 shots and high-speed burst captures up to 11 fps in full resolution. An electronic Level Gauge helps align photos. The touch screen can be used to set the autofocus area and trip the shutter. For more details see the news release below. CENTER VALLEY, Pa. -- Olympus introduces a breakthrough in the long zoom category, the Stylus SH-1, the first compact camera equipped with optical 5-axis image stabilization for both still images and videos. The Stylus SH-1's 5-axis mechanical image stabilization originally developed for the Olympus OM-D E-M5 interchangeable lens camera, combined with a powerful 24x, high-powered optical zoom lens, full 1080 60p HD video and built-in WiFi, delivers outstanding performance in a body with an elegant look and feel. Advanced technology, including a 16-megapixel backlit CMOS sensor and the TruePic VII image processor, the same found in Olympus' award-winning OM-D series of interchangeable lens cameras, work in connection with the Olympus Stylus SH-1's impressive 24x optical long zoom lens, (48x super-resolution zoom) which covers 25mm to 600mm telephoto. This combination delivers beautiful image quality with high resolution, superior color reproduction and high sensitivity. The design of the Olympus Stylus SH-1 is inherited from the popular Olympus PEN interchangeable lens system cameras. The top and main controls are built with aluminum alloy and superior craftsmanship extends to every detail of the camera components, including the lens barrel, dials and grip. Built-in WiFi is easy to set up. Sync with the WiFi network created by the camera by quickly scanning the QR code displayed on the camera's 3-inch, high-resolution 460,000-dot rear touch LCD monitor with a smart device. The complimentary Olympus Image Share app synchronizes a user's iOS or Android mobile device and the Olympus Stylus SH-1 so the camera's Live View is displayed on the phone. The camera can be fully controlled remotely by touching the Smartphone display, as if it were the camera itself and users can send selected images directly to Web sites and social media. The Olympus Stylus SH-1 is equipped with an updated Advanced Movie Mode for powerful video recording functions, including fast 240 fps (or 120 fps in 720p) High-Speed Movie, which allows users to capture subjects that move at split-second speeds and 60-frames-per-second HD recording for smoother images of moving subjects. Photo & Movie Capture allows users to simultaneously capture full-res still photos while recording Full HD video. The Time-Lapse Movie feature compresses up to five hours of action into a 20-second time-lapse video. 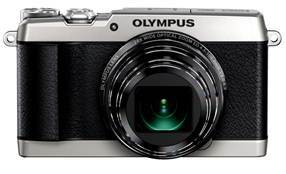 For a complete list of specifications, visit the Olympus Web site: http://www.getolympus.com/us/en/digitalcameras/long-zoom/sh-1.html.